I am not at all surprised this film was nominated for a Best Original Screenplay award. Granted, having a stellar cast and a brilliant director certainly helps, but the screenplay is fantastic fun, which is important when one of the main characters is an English nerd. It starts with a dozen man all living in the same house, devoted to a single cause: writing a new, more-complete encyclopedia for the English-speaking world. Each of them has their own areas of expertise they contribute to the project: history, geography, botany. After years, they are all the way up to the letter S.
Bertram Potts (Gary Cooper), their language expert, is working on the “Slang” section when a chance encounter gives him the rude awakening, that being cloistered in a house of dusty books means that the English language has moved on without him, and he needs to do some field research. This takes him to various places, like baseball games, restaurants, and nightclubs. At the nightclub, he encounters a floor performer, named Sugarpuss O’Shea (Barbara Stanwyck), and I know what you’re thinking, but she’s a singer. Bertram asks Sugarpuss to participate in a study to help him learn modern slang, but she blows him off. A few hours later, she shows up on his doorstep with no explanation except that she has decided she does want to be part of the study, and she’s going to move in to the bachelor pad indefinitely. While the other “professors” are giddy at the thought of having a pretty young woman living in the house, Bertram has reservations. He’s lived his entire life as a sheltered prodigy, and has no “life experience” outside of cold academia. In his mind, a female in the building (aside from their elderly cook) spells dangerous distraction from their main purpose. When he finally orders Sugarpuss to find a new living situation, she confesses a passionate love for him, and says that was the reason she wanted to live there in the first place. Unknown to Bertram, Sugarpuss is already in a relationship, with gangster Joe Lilac (Dana Andrews, a film noir icon). Lilac is in trouble with the police, the cops are looking for Sugarpuss, she needed a place to hide, so she wormed her way into the encyclopedia mansion. To stay there, she has to keep Bertram blindsided with love. Her plan works a little too well, however, and Bertram falls head over heels. To the point that he even proposes to Sugarpuss, a few days after meeting her. Because she isn’t actually a heartless hussy, Sugarpuss starts to feel guilty about using Bertram’s emotions to protect another man, even her fiance. And she also gets to experience being courted by a real gentleman, albeit a ridiculously naïve one. But the police start closing in, Lilac is getting desperate, and she has to decide whether to stick with the crook or with the brain. It’s kind of your classic “bad boy vs. the geek” love story, only without the direct competition angle. And with a script that revolves around the English language, you know it has to be solid, snappy dialogue. 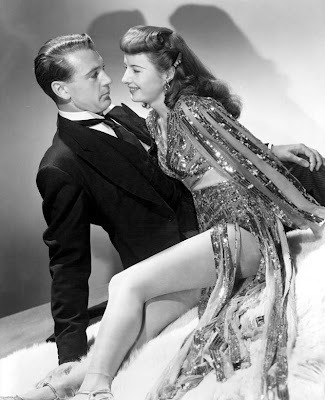 Gary Cooper and Barbara Stanwyck are wonderful together, and each in their signature-style roles, he being the galumphy, awkward “aw shucks” leading man, Stanwyck is the sassy, saucy femme fatale, only this time without the fatale, since it’s a comedy. 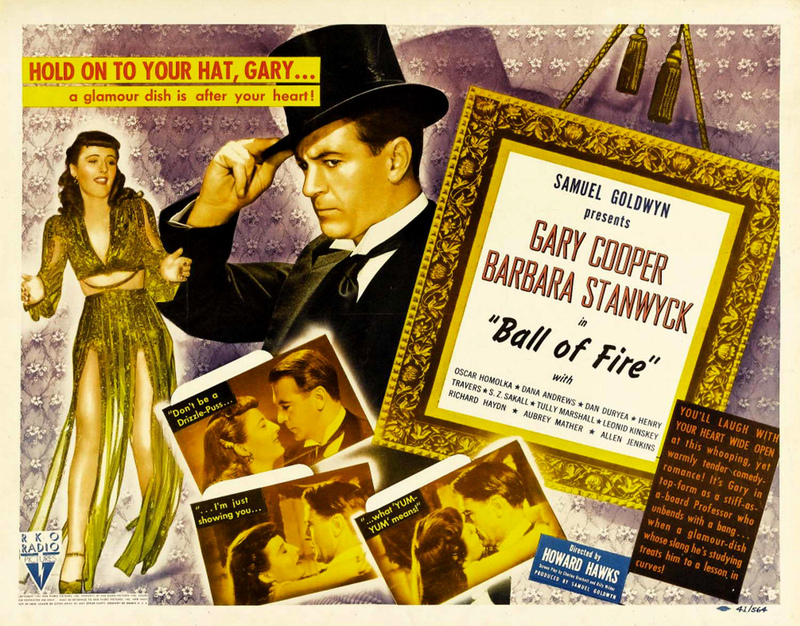 “Ball of Fire” will be on TCM on Tuesday, Feb 11, at 9:15 am CST.